Kites paint the sky at the Rogallo Kite Festival. There is probably no better way to celebrate Francis Rogallo than with the Kitty Hawk Kites Rogallo Kite Festival. Held this coming weekend, June 15-17, at Jockey’s Ridge State Park, the 36th annual edition of the festival is a must stop and see part of the Outer Banks experience. Francis Rogallo was a NASA scientist who, in his spare time, invented a steerable flexible wing—the basis for hang gliders. paragliders, modern parachutes…and stunt kites. Mr. Rogallo was a longtime resident of Southern Shores and an ardent supporter of all things that fly. He passed away in 2009, but his legacy lives on in the many designs of stunt kites and the sport of hang gliding on the Outer Banks. The Rogallo Kite Festival has something for everyone. 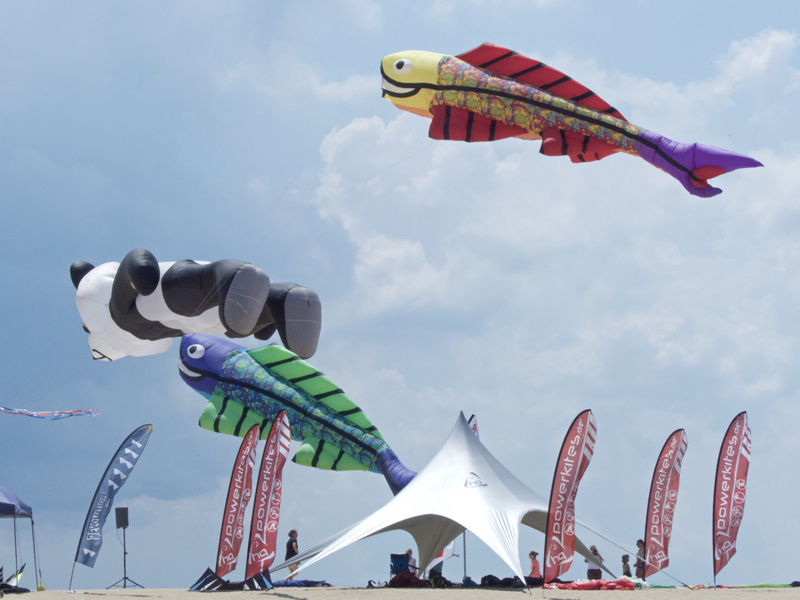 When Kitty Hawk Kites puts on a festival, they pull out their biggest, most spectacular kites and seeing 40’ and 50’ dragons, dogs and other animals floating in the wind above Jockey’s Ridge is an amazing sight. The festival is all about kites and kite flying. There are stunt kite demos all day with instruction from Kitty Hawk Kites employees and representatives of some of the kite companies. One of the most spectacular things to do—or maybe it falls under the heading of fun—is to fly a power kite. The power kites that make their appearance at a show like the Rogallo Festival are usually frameless, using the wind to fill baffles and give the kite lift. With no frame, they can’t be broken. And that’s good, because the first experience with the wind catching an 8’ power kite is…interesting. For a challenge, there will probably be some quad line kites to try as well. More difficult to steer than a standard dual line stunt kite, when mastered the range of maneuvers a quad line kite can accomplish is astonishing. The weather is looking good for the weekend, so check it out. The Rogallo Kite Festival is just one of many activities scheduled for the summer on the Outer Banks. Need a place to stay while checking out all there is to do on the Outer Banks? Check out our listings at Joe Lamb Jr., & Associates.